The aim of Chiropractic treatment is not only for pain relief but also to restore and maintain optimal health and wellbeing. Chiropractic is the largest independent drug-free primary healthcare profession specialising in the diagnosis and treatment of many disorders. You may feel such disorders as pain in the spine and other joints of the body, often giving rise to low back pain, neck pain, headaches and dizziness. Pain or sensation changes in the arms and legs usually have their origin in dysfunction of the spine, which causes irritation to the nervous system. Chiropractic is an independent primary healthcare profession specialising in the diagnosis and treatment of biomechanical disorders. You may feel such disorders as pain in the spine and other joints of the body, often giving rise to low back pain, neck pain, headaches and dizziness. Pain or sensation changes in the arms and legs usually have their origin in dysfunction of the spine, which causes irritation to the nervous system. The nervous system controls and co-ordinates all bodily functions – keeping us alive and healthy, fighting off diseases and infections, and healing us after we have sustained injury. If you interfere with the signals travelling over nerves, parts of your body will not get the proper nerve messages and will not be able to function at 100%. In other words, some part of your body will not be working properly. Remove irritation to the nerves. What is the cause of a spine that doesn’t work well? Typical causes for a spine not working well include poor posture, lack of exercise, repetitive strain and car accidents. Chemical factors, such as diet and water intake, and emotional factors, such as stress and anxiety, also have an affect on the function of your nervous system. All ages can benefit from Chiropractic care – from infants just a couple of weeks old – suffering from colic – to people well into their nineties. In most cases the pain and disability is caused by the same mechanism regardless of age. We all sustain minor injuries through life – most of which are correctable by specific Chiropractic treatment. Arthritis may render joints more likely to dysfunction but in most cases these problems can still be optimised by specific chiropractic adjustments. How can I tell if my spine is not healthy? Chiropractic rehabilitates spinal muscles and ligaments to prevent spinal imbalances. Chiropractic has provided effective relief to millions of individuals suffering from back and neck ailments. Chiropractic has also provided relief from many other musculoskeletal complaints ranging from knee and ankle problems to carpal tunnel syndrome and tennis elbow. In fact, musculoskeletal pain or discomfort in any area of the spine or extremity is a candidate for safe, natural, non-invasive chiropractic care. Chiropractic doctors are experts in maintaining proper spinal alignment and function, both of which play a critical role in minimizing spinal stresses – the stresses that are responsible for injury and accelerated arthritis shown here by damage to the spinal discs. How do we do Chiropractic? 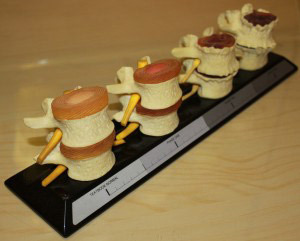 This is done through a series of gentle and safe precise ‘adjustments’ of specific joints. The adjustments are done by skilled hands and are not usually painful. Some of the treatment techniques produce a ‘CLICK’ or ‘CRACK’ from the joint, which may be a new experience for the patient yet pain free. Treatment restores normal function of the joints, whereby irritation to the nervous system is alleviated. The aim of treatment is not only to relieve symptoms but to restore and maintain optimal health and well being. For more information, read the ‘Our Techniques‘ page. A recent study conducted by the Medical Research Council showed that patients who received chiropractic treatment for low back pain experienced a greater reduction in disability than those who attended hospital out-patient departments. The benefits of chiropractic care were also longer lasting. The study recommended that Chiropractic treatment should be available on the NHS in Britain. Many insurance companies cover the cost or part of the cost, of treatment. Chiropractic – no surprise it’s the largest primary contact drugless healing profession in the western world. If you think that you or a loved one is a good candidate for chiropractic care, contact The Thames Clinic to arrange a thorough examination in our practice. In Staines, Egham & Ashford – Your Choice. Your Health.